Throughout this holiday season, many student-athletes, coaches and administrators have come together to take part in various service activities, large and small. Teams & Toys is a community service project that allows Princeton’s varsity teams to adopt underprivileged families in the local Princeton community for the holiday season. Participating Princeton teams purchase and donate gifts for the children of their adopted families. The culmination of the project is the Teams & Toys gift wrapping party held on Wednesday, December 4th at the Frist Campus Center. 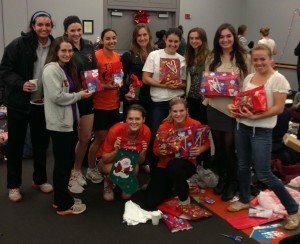 Athletes in Action and the Princeton Varsity Club provide wrapping supplies, food, music, t-shirts and a festive atmosphere where student athletes can interact with one another, wrap their gifts and enjoy the spirit of giving back to the local community. These gifts are then distributed to local families through the help of Community House in Princeton. Following the wrap party, student-athletes were invited to attend Community House’s Holiday Party on Sunday, December 8th at Carl Fields Center. Activities such as holiday ornament and cookie decorating and getting a photo with the Princeton Tiger were set up to engage and interact with Community House program participants. To see more photos from the Teams & Toys wrap party and Community House’s Holiday Party, click here. The Soap Project: A simple way to engage student-athletes and coaches in a year-long commitment to community service, the Soap Project is a program that encourages the varsity teams to collect their unused toiletries (soap, shampoo, etc.) throughout the year when traveling. This semester, Princeton student-athletes, coaches and administrators collected over 40lbs of soaps and toiletries for HomeFront through the PVC Service Circle. The items were donated just in time for the upcoming holiday season. A second donation will be made following the completion of the spring semester.